The Seven Wonders of the Ancient World (often called simply, the Seven Wonders of the World) is a list of man-made structures built during the classical era. Scholars believe that ancient historians began compiling the list in the second century B.C. The final list of the Seven Wonders that we currently reference was defined in the Middle Ages. Noted for being the only surviving member of the Seven Ancient Wonders of the World, the Great Pyramid is the largest of the 3 pyramids built in the ancient city of Giza, now part of greater Cairo, Egypt. 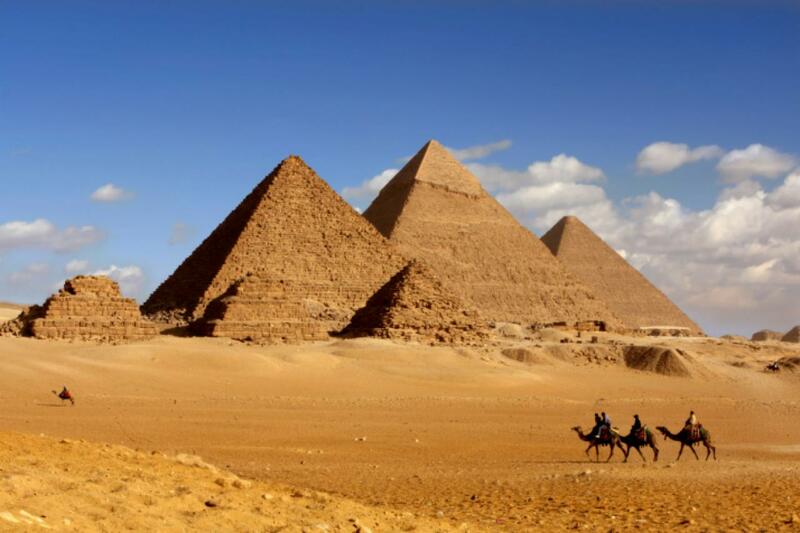 The pyramid is believed to have been built around 2560 B.C. as a tomb for the Egyptian Pharaoh Khufu, and likely took 20 years to construct. (Egyptologists argue over man-power numbers, and estimates have ranged from 14,000 to 360,000 men). When built, the pyramid measured nearly 480 feet high, with the sides each measuring about 755 feet long. In addition, each side is oriented with one of the cardinal points (north, south, east and west). Nearly 2.3 million blocks of stone, each weighing approximately 2 tons, comprise the pyramid. The pyramid remained the world’s tallest building for 4 millennia after it was built. The Hanging Gardens of Babylon are said to have been built by Nebuchadnezzar II, a ruler of Babylon, around 600 B.C. Though historians often debate the actual existence of the gardens, because there’s no physical evidence and Babylonian documents never mention them (Greek scholars first described the gardens), accounts state that the gardens consisted of vaulted terraces raised above one another and supported on pillars — in other words, an artificial rising mountain of gardens. The terraces were filled with dirt and planted with trees and flora, which were said to hang over the sides. The amazement over the gardens stems from what would have been an extraordinarily complicated irrigation system, which brought water from the Euphrates to the gardens in an otherwise arid environment. The gardens are thought to have been destroyed by an earthquake around the first century B.C. Completed around 550 B.C. to honor the Greek goddess of hunting and nature, the Temple of Artemis was built during the Achaemenid Dynasty of the Persian Empire. Arson destroyed the temple in 356 B.C. The ancient author and philosopher Pliny described the temple as being 377 feet long and 180 feet wide (about 3 times the size of the Parthenon), with 127 Ionic columns measuring 60 feet high, and made solely of marble. Used as both a marketplace and a place of worship, the temple housed numerous works of art and sculpture. This enormous statue honoring the god Zeus was built at the Temple of Zeus in Olympia around 450 B.C. Designed by the Greek sculptor Pheidias, the statue of a seated Zeus measured 40 feet tall and was carved from ivory with gold-plated accents. The statue depicts him seated on a cedar throne inlaid with jewels, holding a statue of Nike (goddess of victory) in his right hand and a scepter with an eagle on top in his left hand. Various theories exist to explain the statue’s destruction. Some scholars believe that it was destroyed along with the temple in the fifth century. Others argue that the statue was brought to Constantinople, where it was destroyed in a fire in A.D. 462. The tomb built to hold the remains of the Persian king Mausollos and his wife, Artemisia, was designed by the Greek architects Satyrus and Pythius and constructed around 353 B.C. on a hill overlooking the ancient city of Halicarnassus. The tomb stood 135 feet high, and its exterior was surrounded by an ornamental frieze. Numerous statues, bas-reliefs and columns decorated the exterior of the ornate and enormous tomb, and eventually the term “mausoleum” became used to describe any large and impressive tomb. Multiple earthquakes ultimately led to the destruction of the tomb in the 14th century. The Colossus of Rhodes was actually an enormous, looming 100-foot tall statue of the Greek god Helios, built on the island of Rhodes around 280 B.C. The statue was erected to commemorate the island’s patron god, Helios, after Rhodes successfully defended itself in 304 B.C. from an invasion. Scholars believe that the statue stood either on a pedestal at the entrance to the island’s harbor or on a breakwater in the harbor. An earthquake destroyed the statue in 226 B.C., a mere 54 years after its construction. Scholars estimate the Lighthouse of Alexandria measured between 383 and 450 feet high and was built in the third century B.C. to act as a landmark for Pharos, a small island off the coast of Alexandria, Egypt. The lighthouse’s tower was built using light-colored stone, and at its highest point, a mirror was placed to reflect sunlight during the day; at night a fire burned to give off light. Some historians believe that the light given off could be seen for some 35 miles. The lighthouse was damaged by 2 earthquakes in 1303 and 1323, and its remains were destroyed in 1480, when a fort was built on the site.